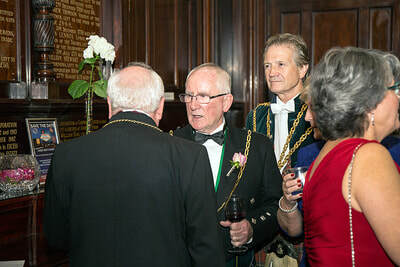 All photographs at this event were taken by Les Hoggan. 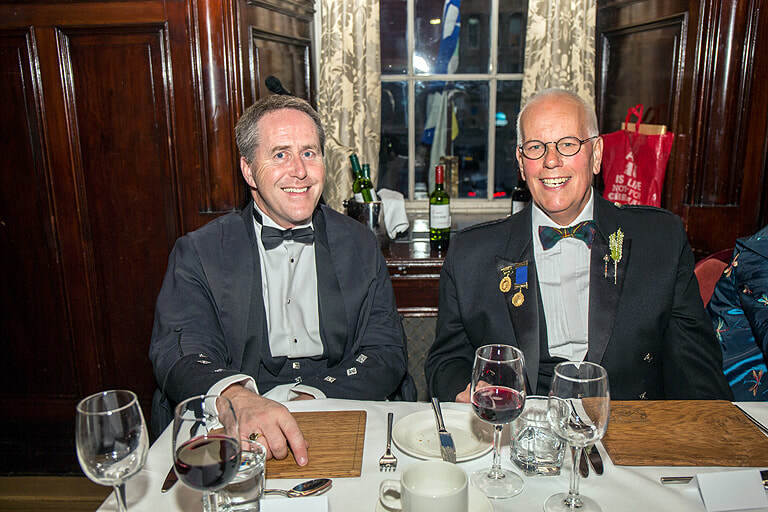 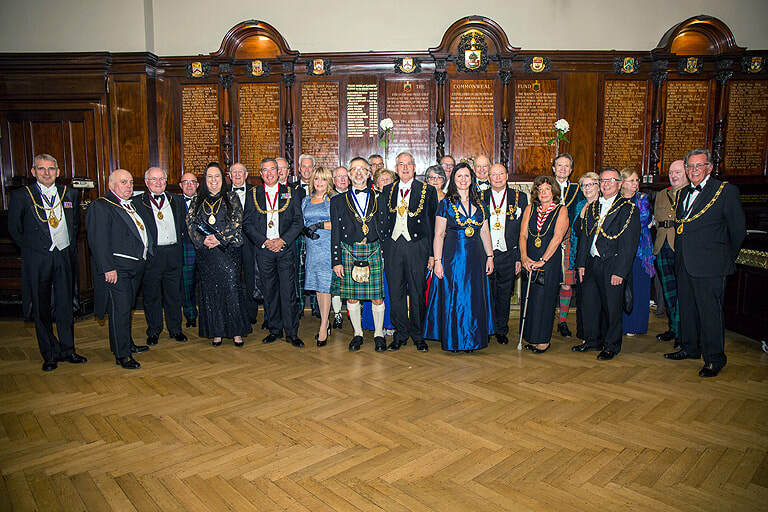 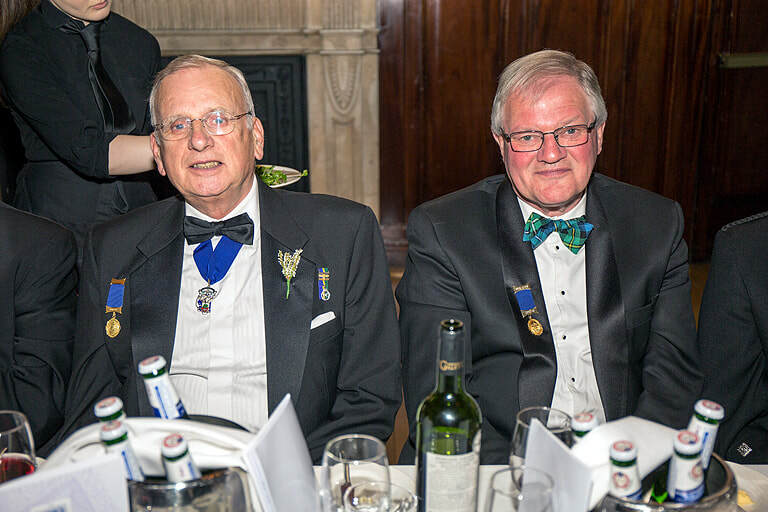 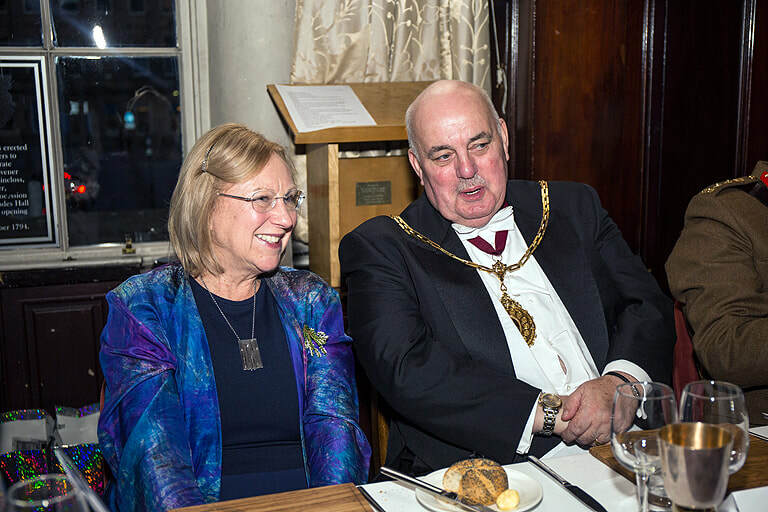 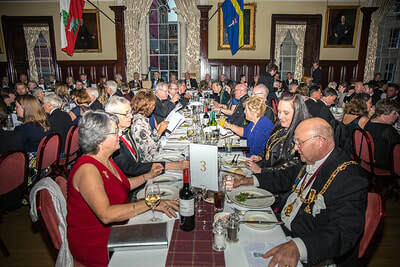 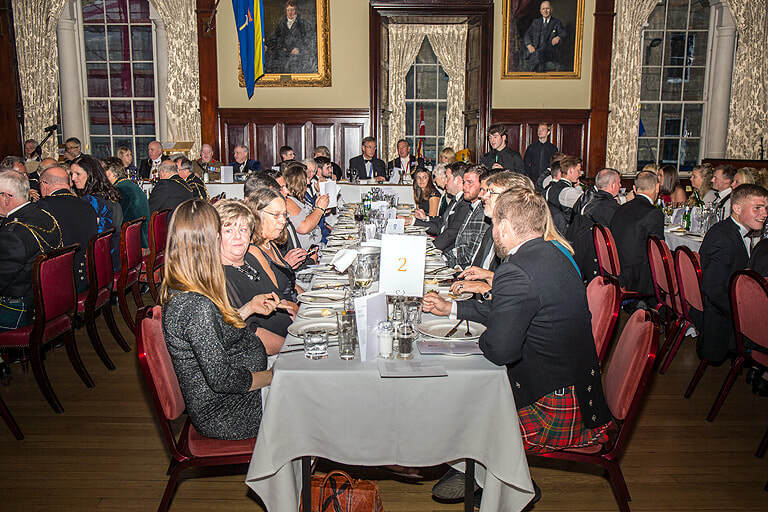 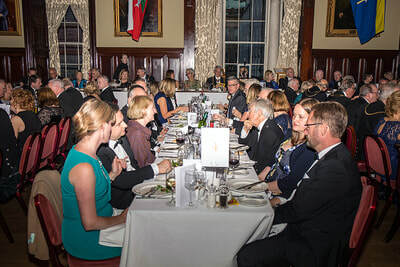 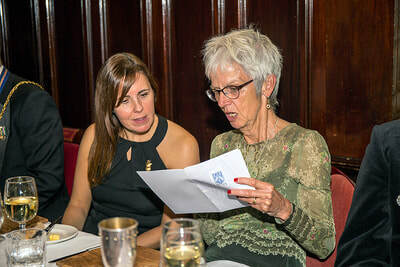 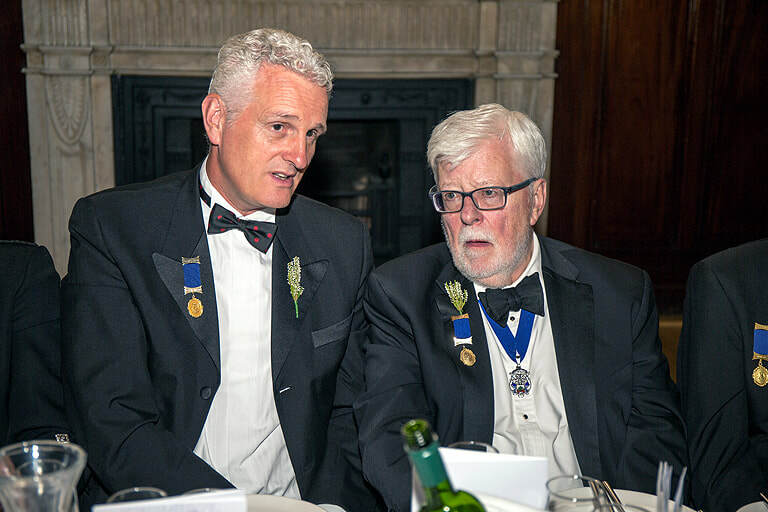 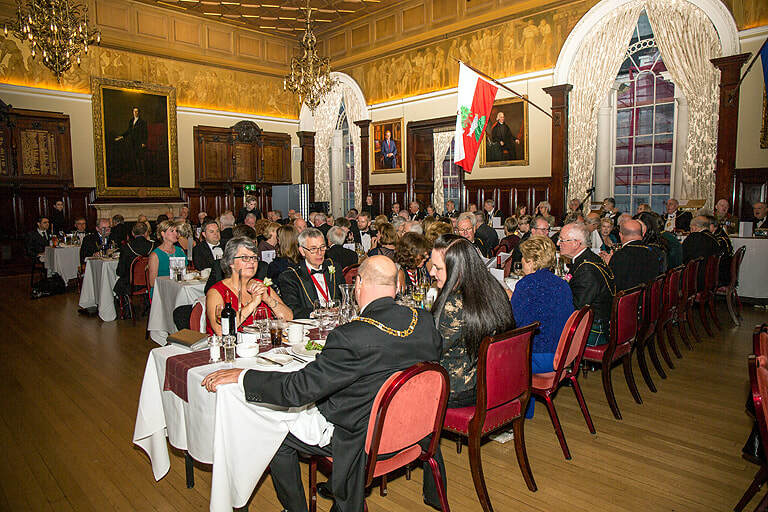 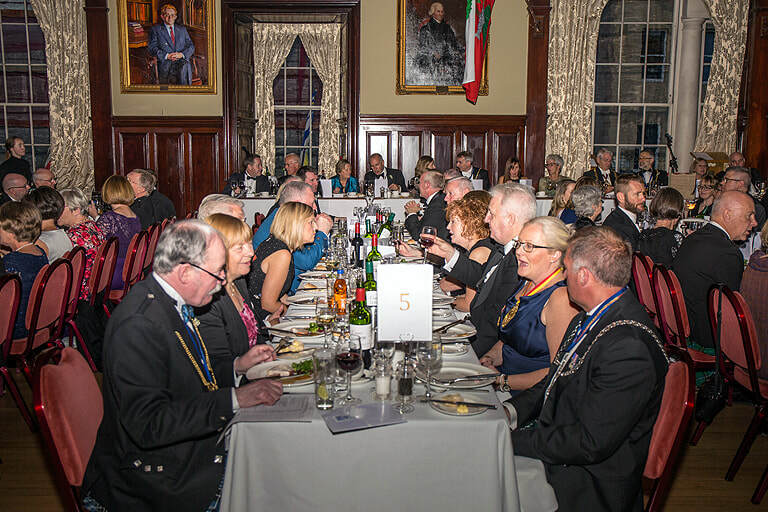 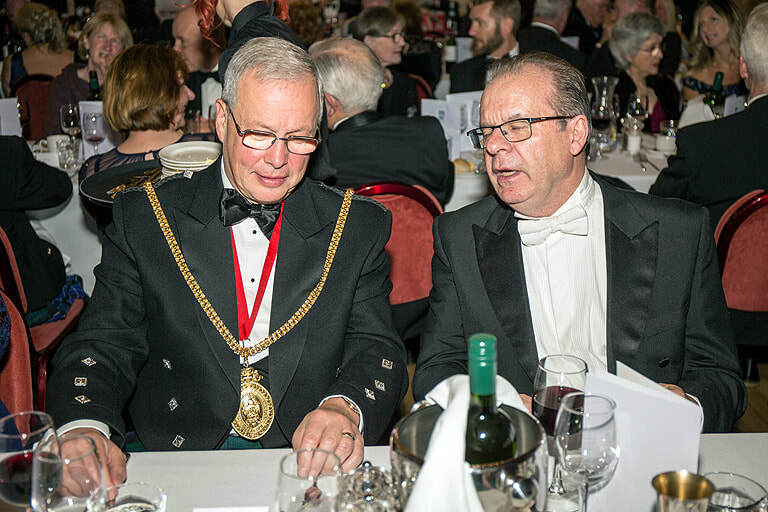 The Merry Mason's Deacon's Choosing Dinner is the first in the new calendar of events and as such it sets the standard for all the other Incorporations in the coming year. 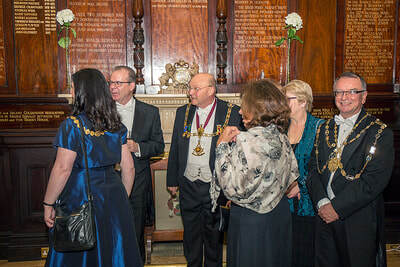 The evening starts with the Deacon welcoming guests to the Trades Hall. 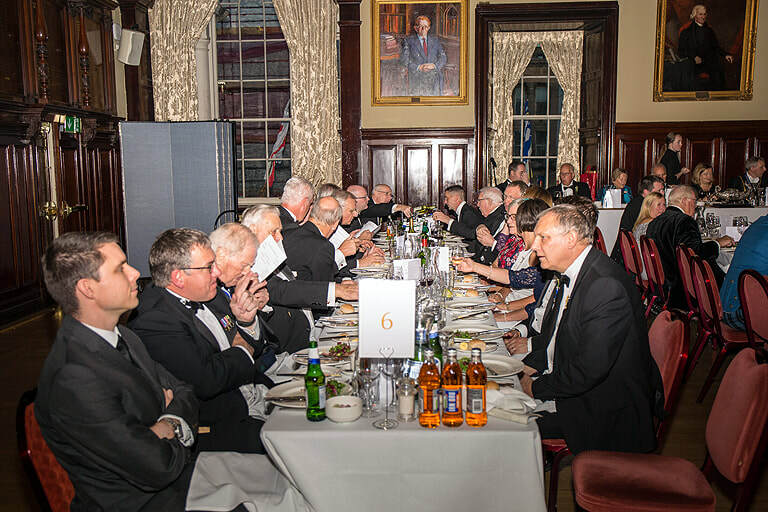 The top table is dressed in white tie, Highland attire or uniform. After the drinks reception the ordinary guests are piped into the Grand Hall, then the Chain Gang and finally the top table are piped in. Deacon Gordon Weetch toasting Piper, Past Deacon Iain Smith. 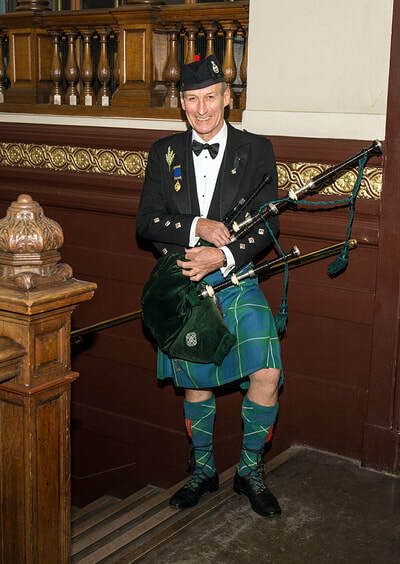 When everyone is seated the Deacon calls in the piper to toast him for his fine playing. 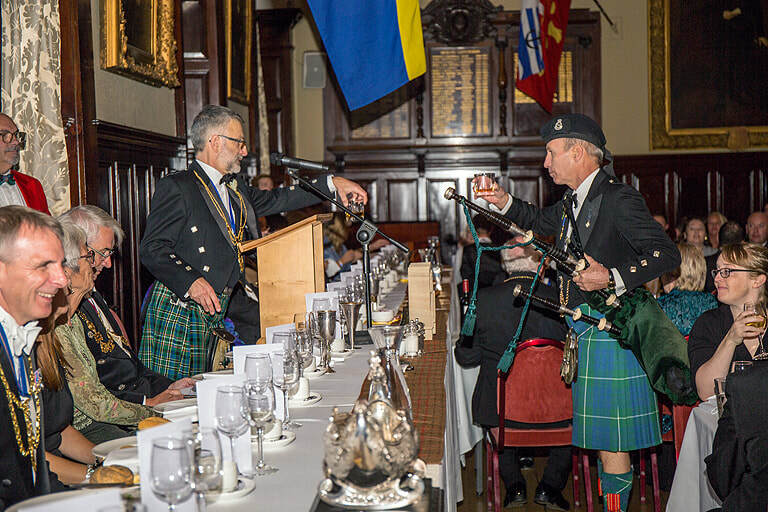 The toast was also in the past the payment to the piper for his work. The top table were given a quick introduction prior to the Collector saying grace and everyone enjoying their fine meal. After the delicious meal, the Deacon led the toast to "The Queen" which all joined in. 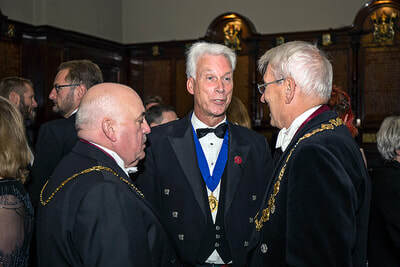 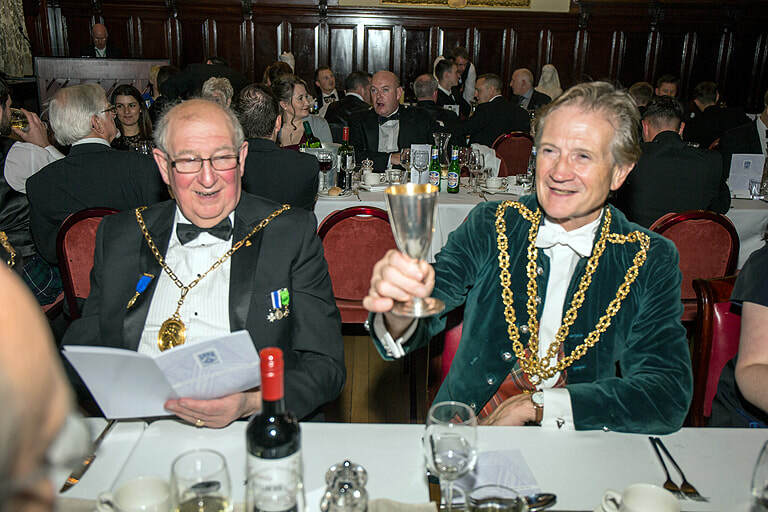 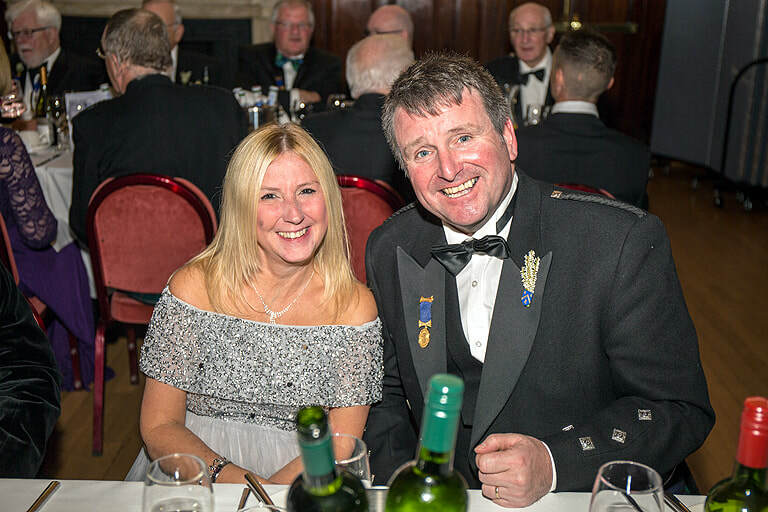 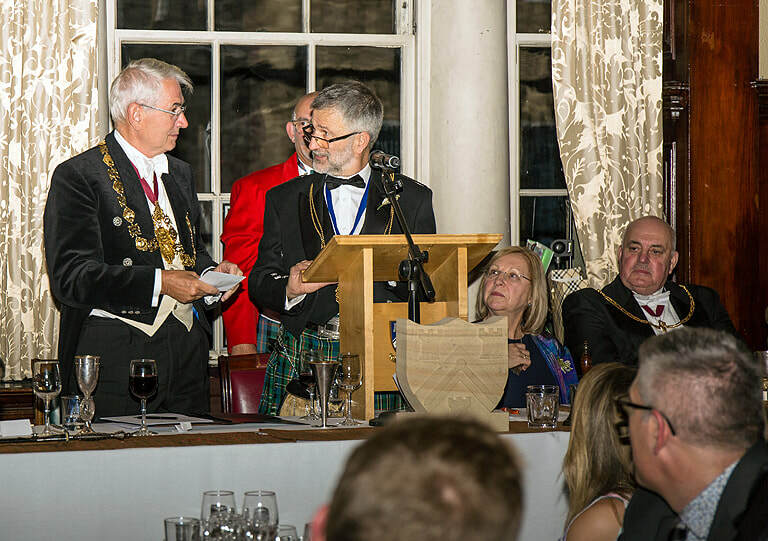 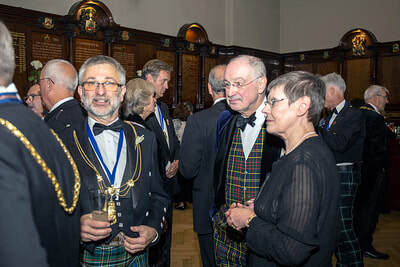 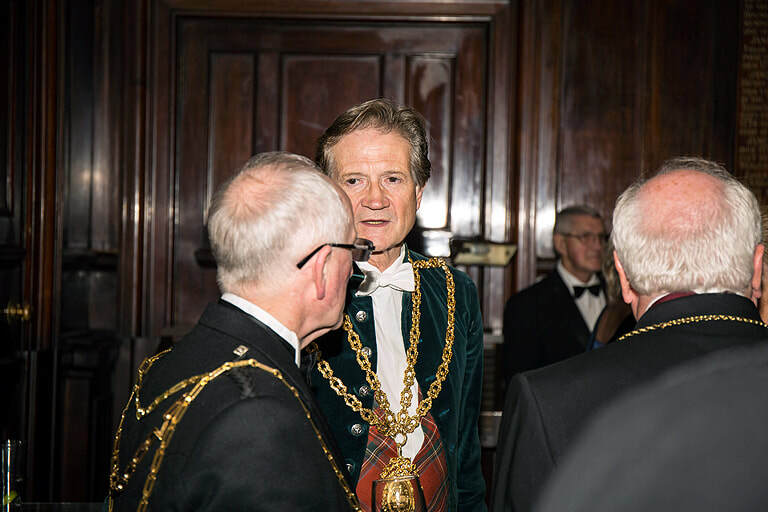 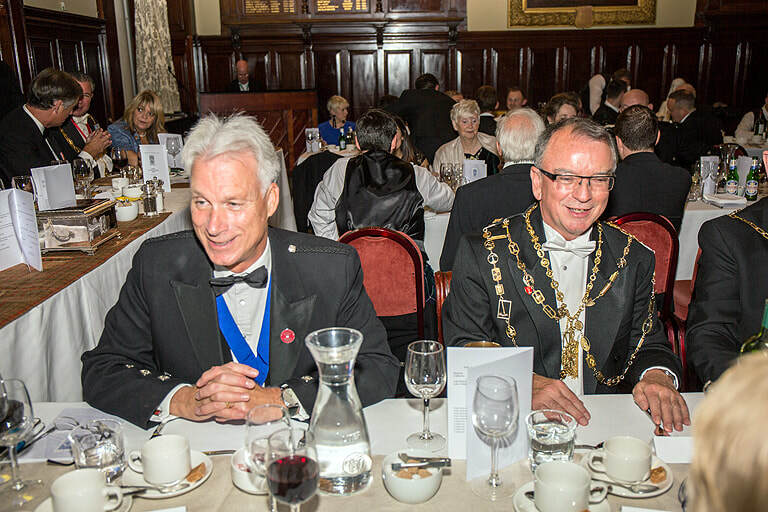 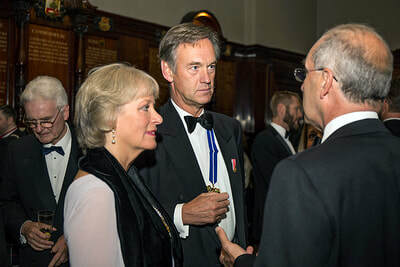 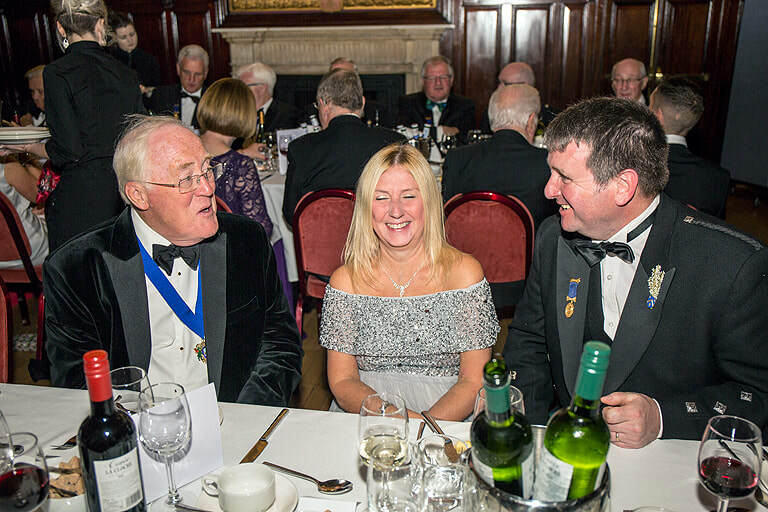 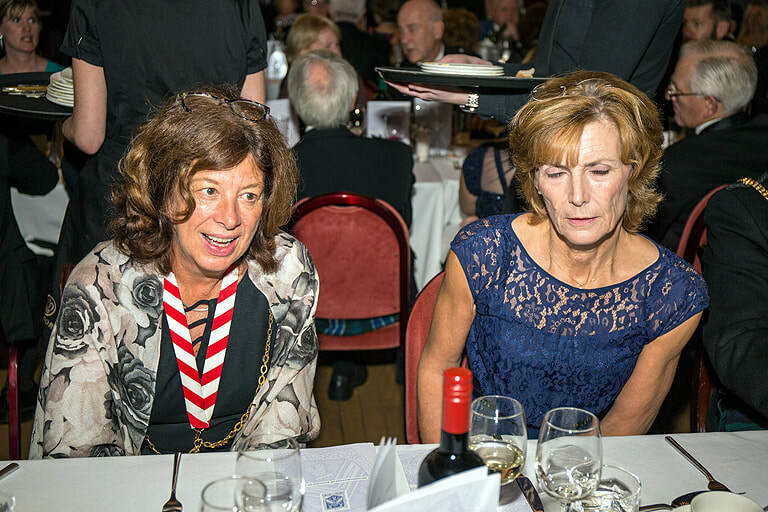 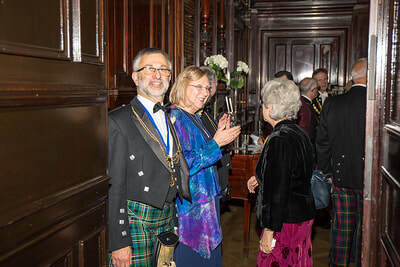 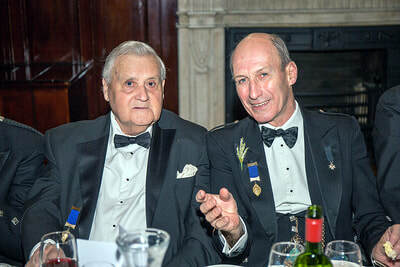 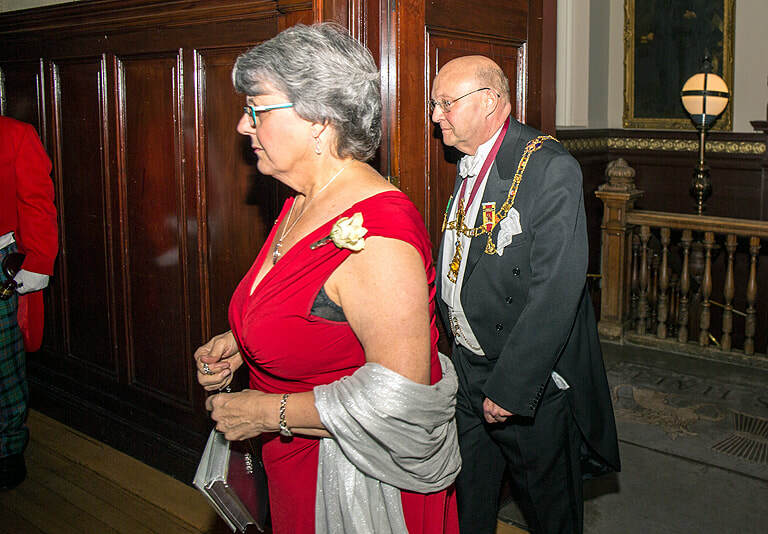 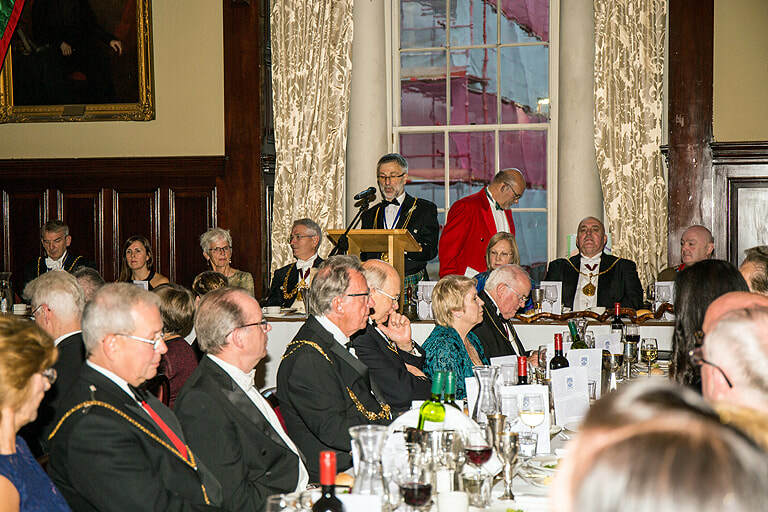 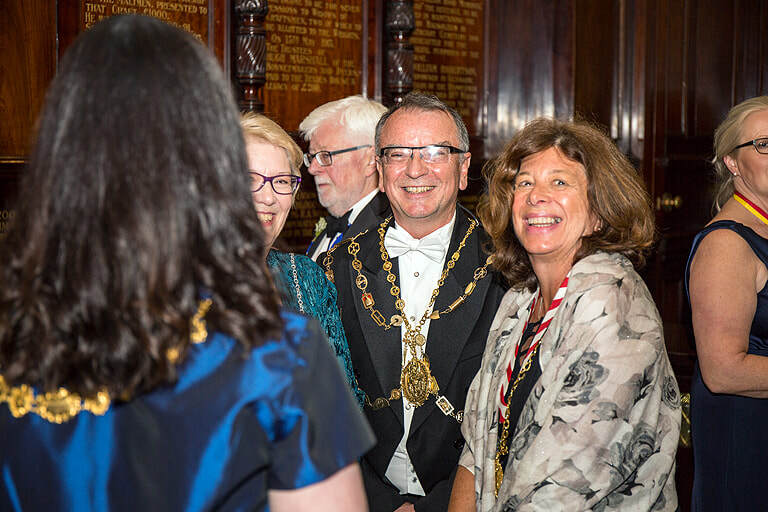 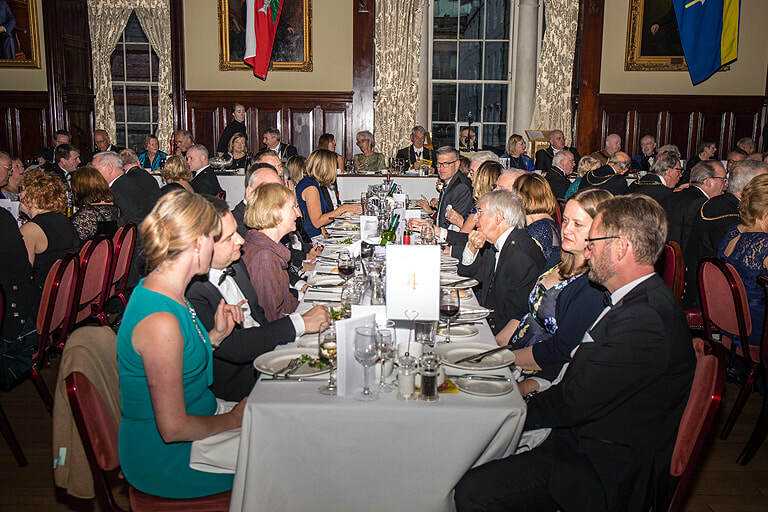 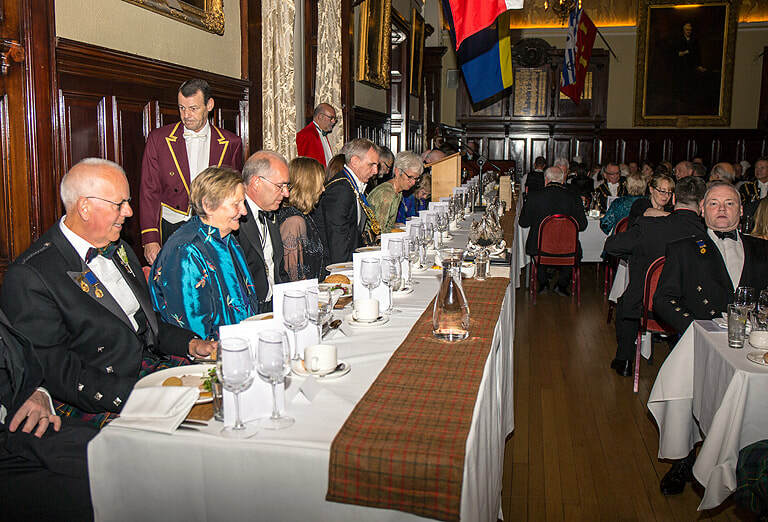 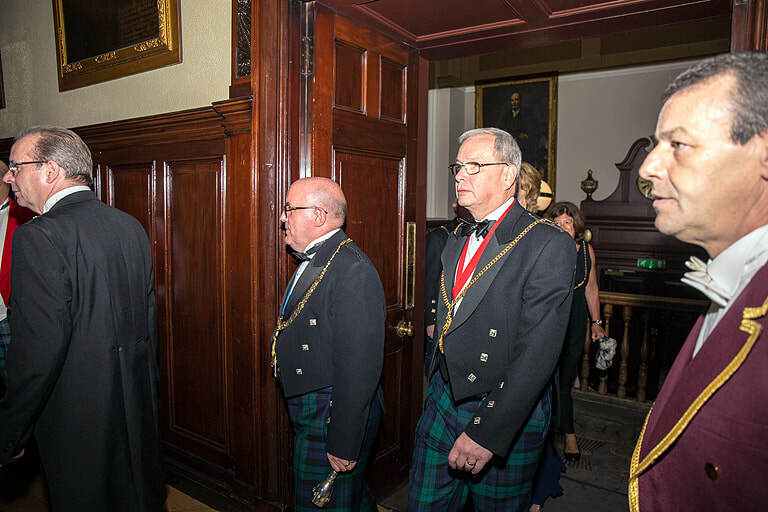 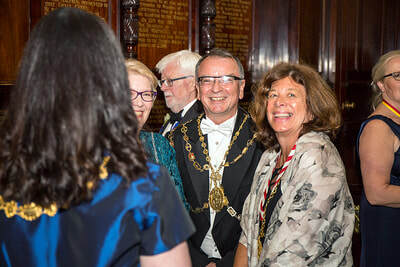 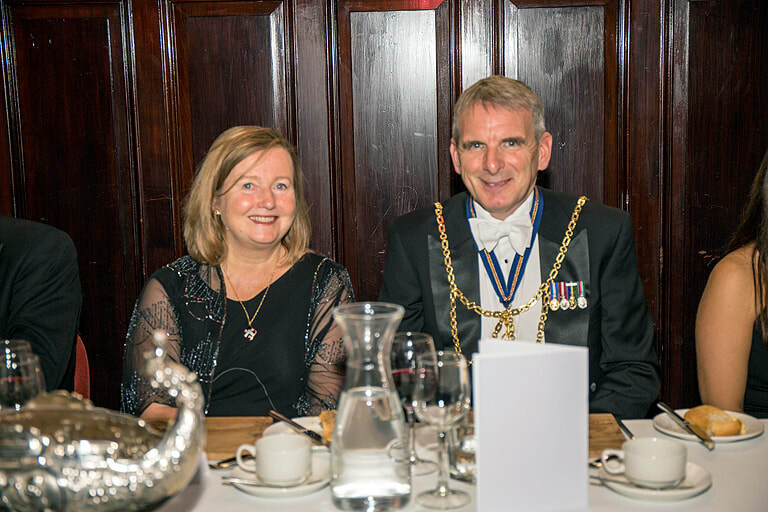 The Toast to the Incorporation of Masons was given by Brigadier (Retired) Alistair MacMillan who had clearly spent a considerable time preparing for this important speech. 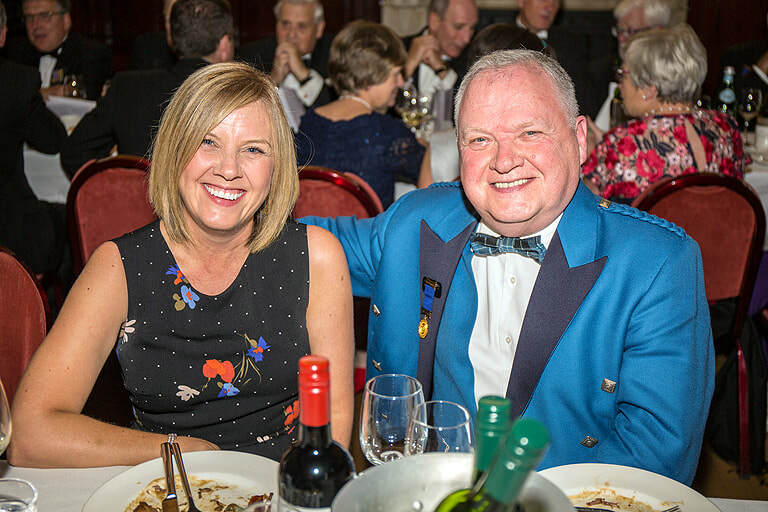 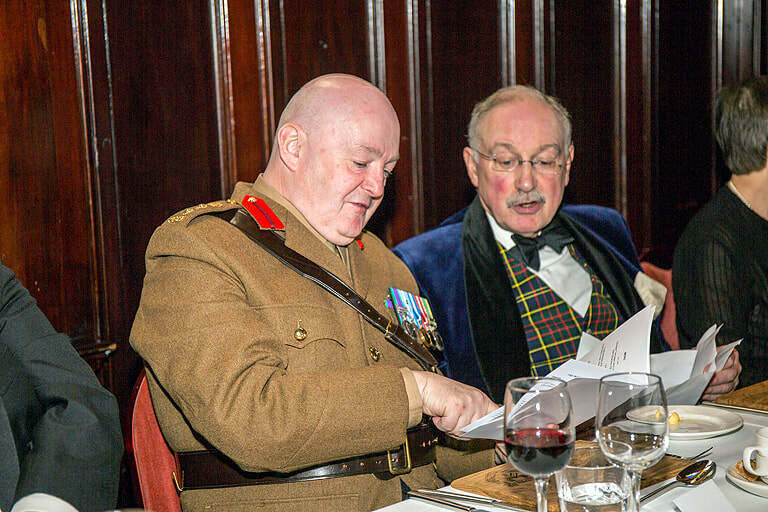 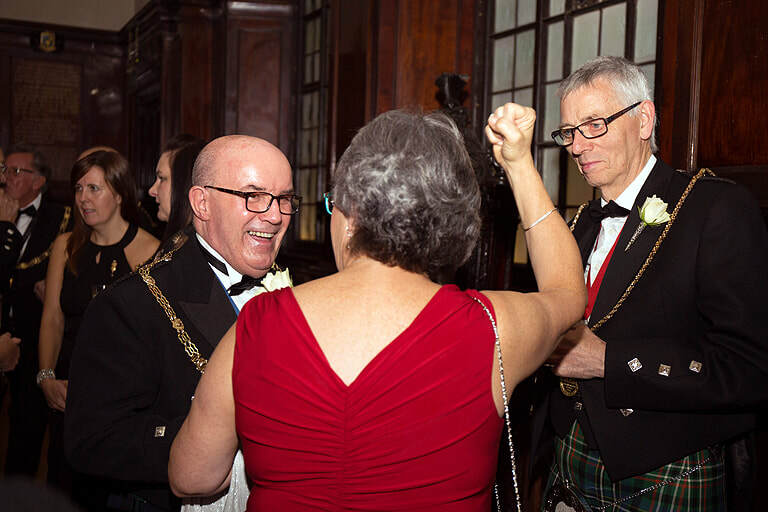 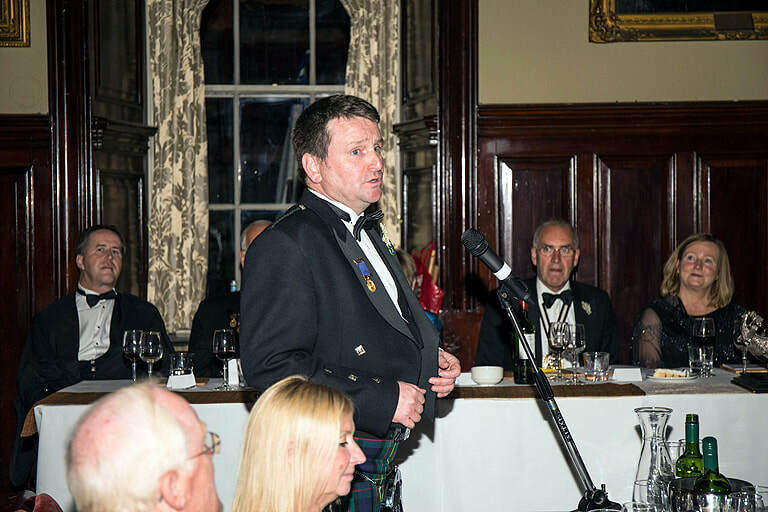 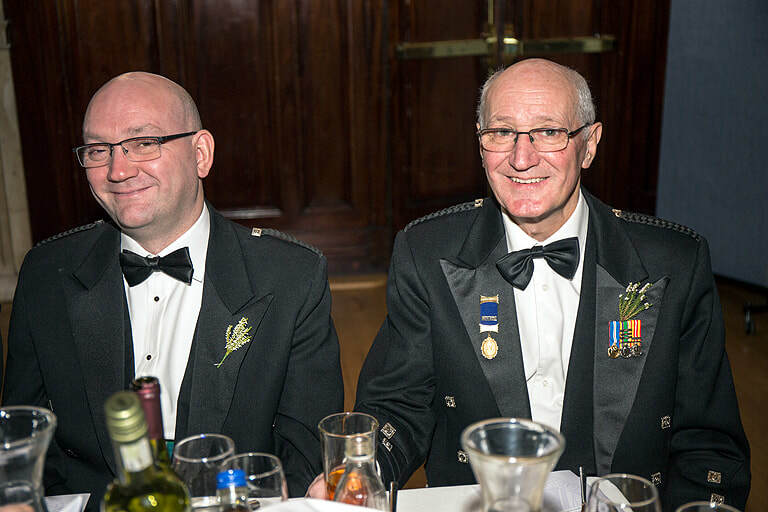 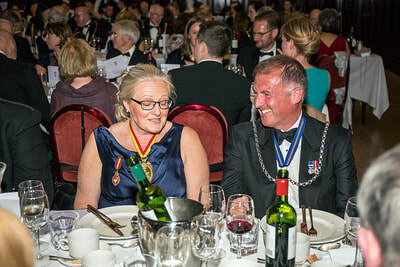 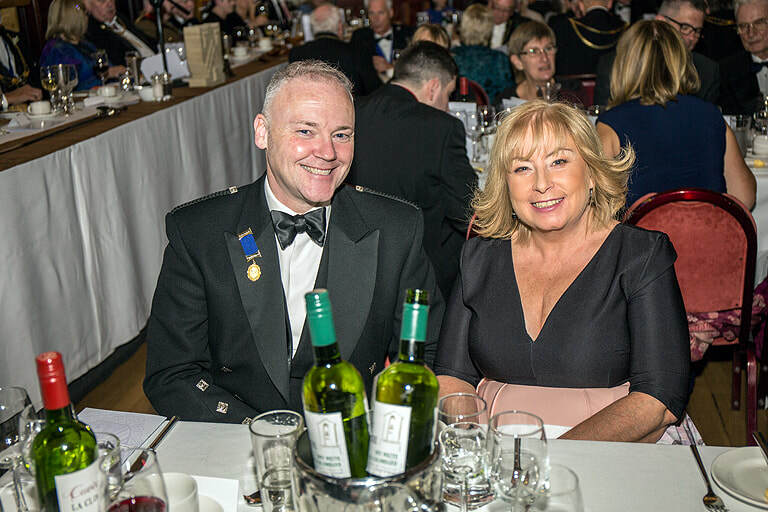 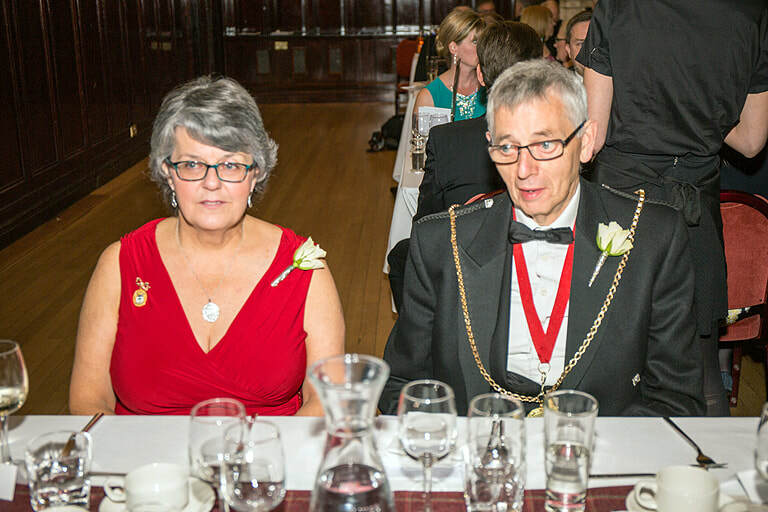 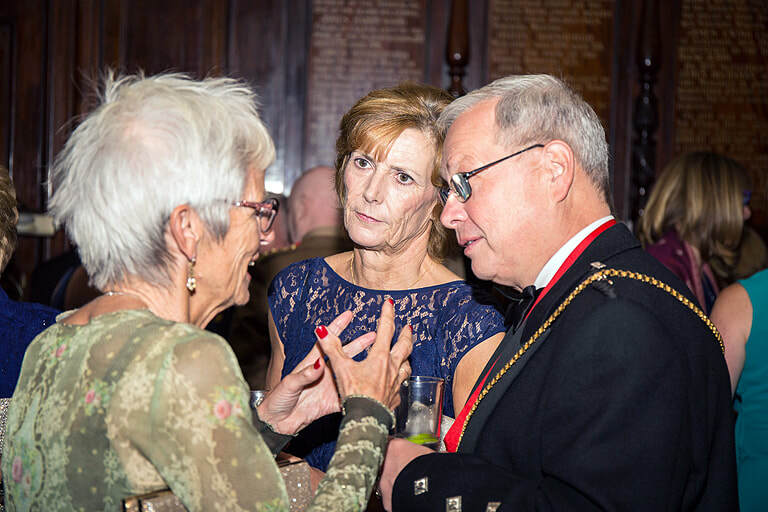 The reply was given by Past Deacon Alan McLennan who delivered a short, amusing and enlightening reply to the Brigadier's toast. 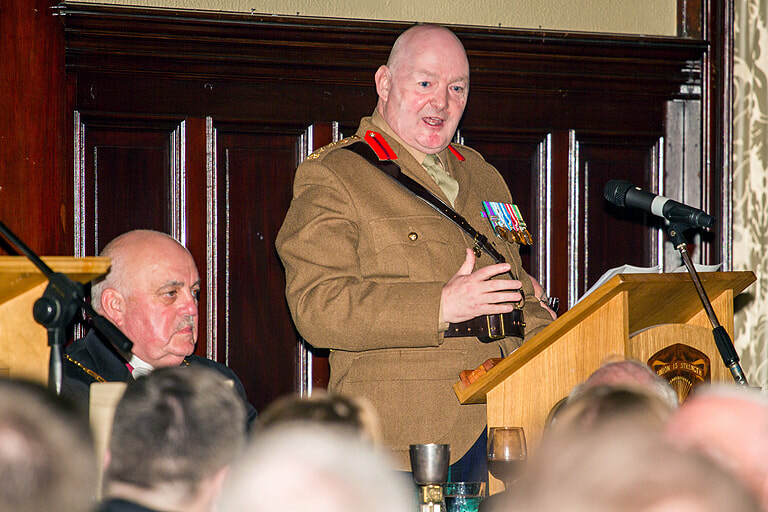 Colonel Alex McNamee giving the Toast to the Trades House. 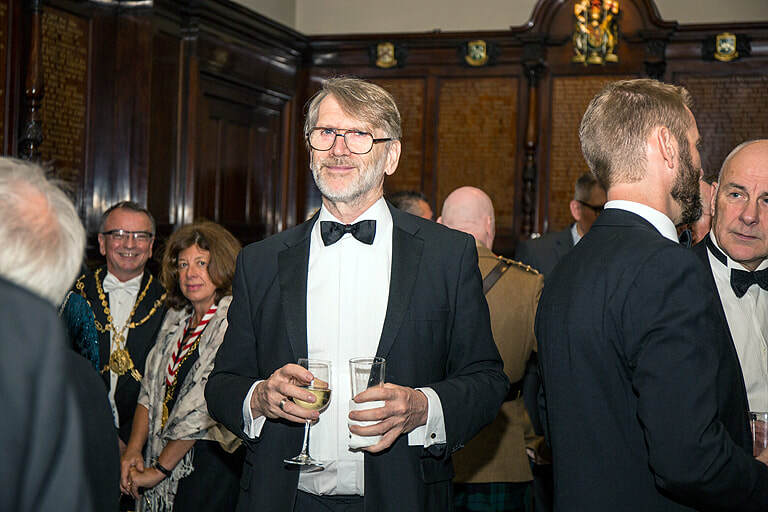 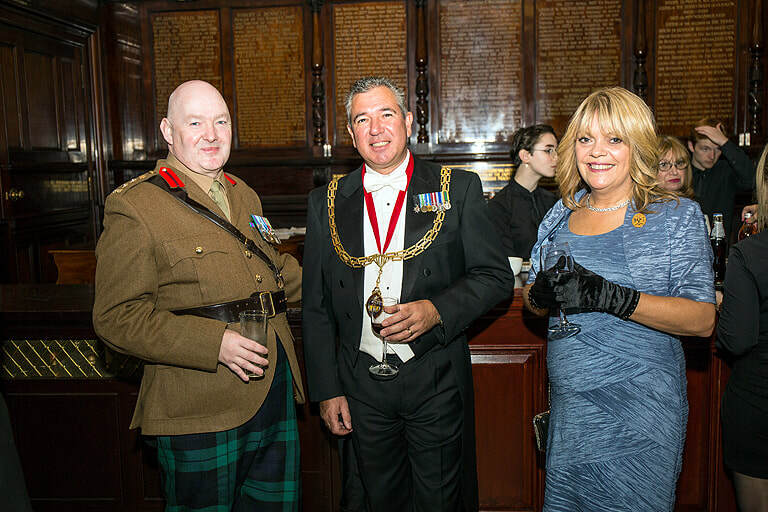 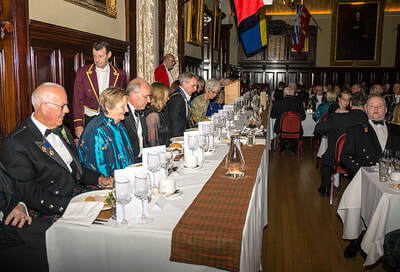 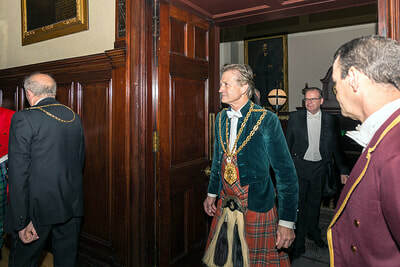 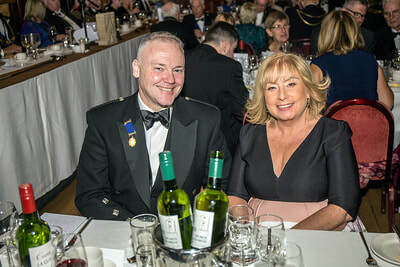 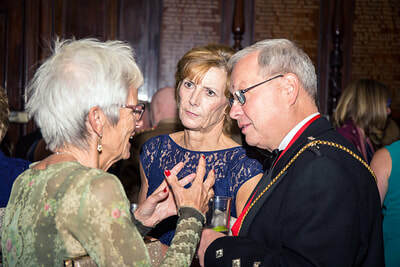 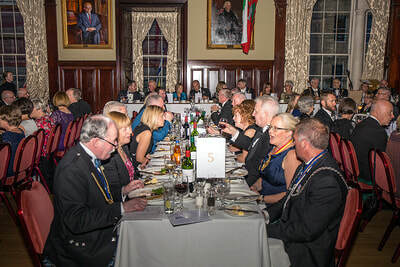 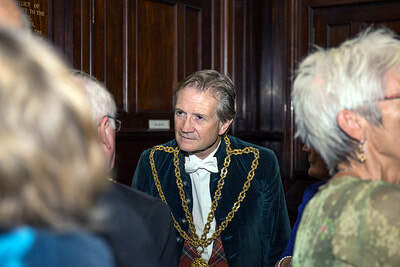 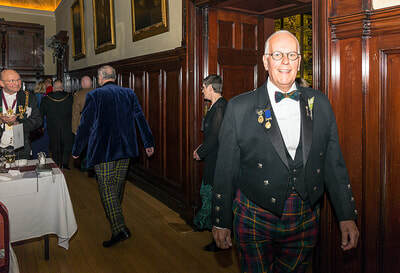 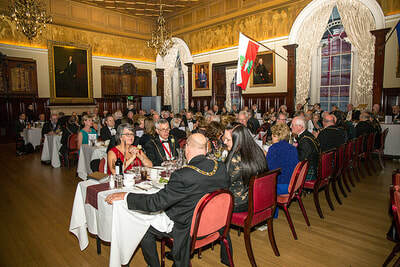 Colonel Alex McNamee, Commandant of Glasgow and Lanarkshire Battalion, Army Cadet Force gave an impassioned toast to the Trades House in which he highlighted the House's past connections to the military and the importance of youth, an area of interest to the House and the Army Cadet Force. 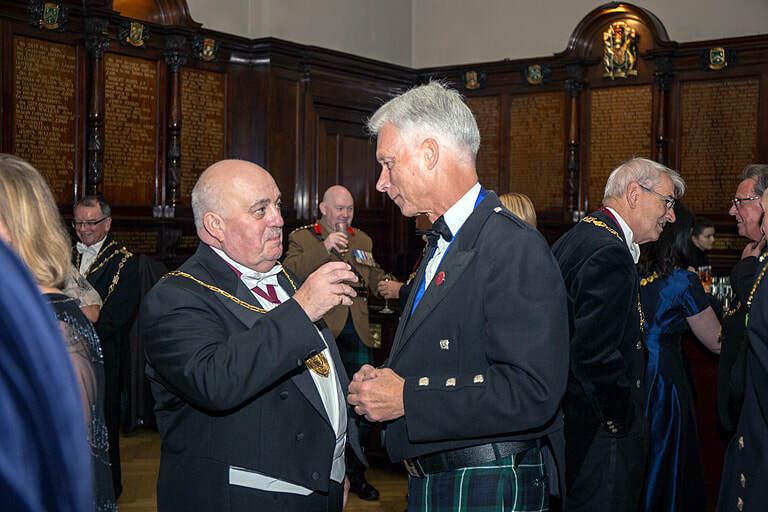 The Incorporation had agreed on an affiliation with the Battalion and two cadet N.C.O.s were present to receive awards from the Incorporation. After Colonel McNamee's Toast there was a loud knock at the door and we were entertained by a visitation from the Fleshers who reported on the Mason's healthy accounts and good deeds for the year. 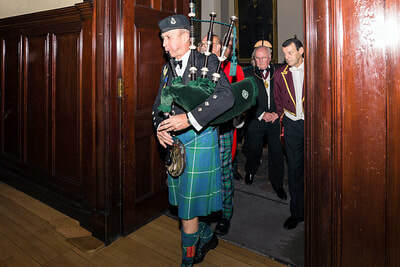 Gifts were exchanged before the visitors left to the sound of "Will Ye No Come Back Again". 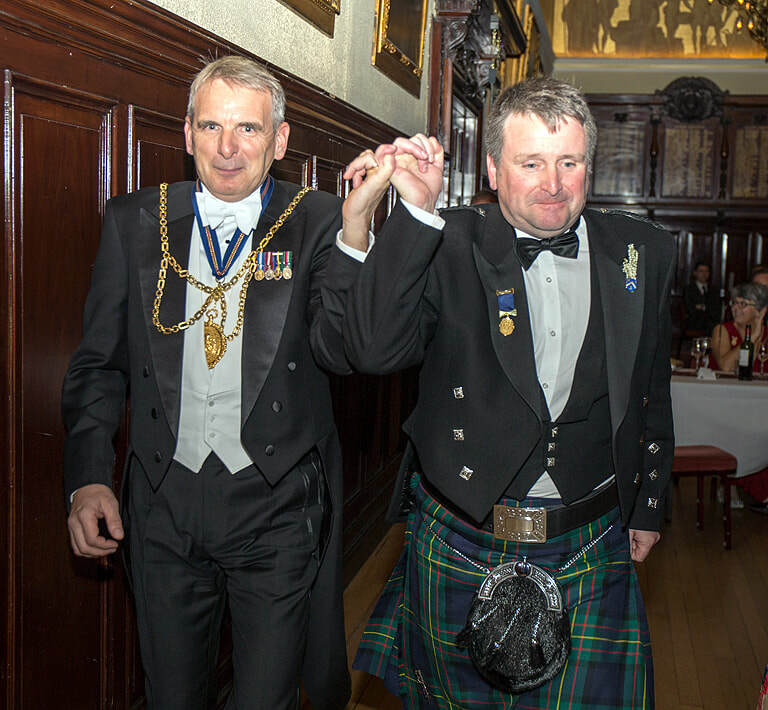 The tradition of coming in holding right pinky (little finger) to right pinky was slightly modified by our visitors. 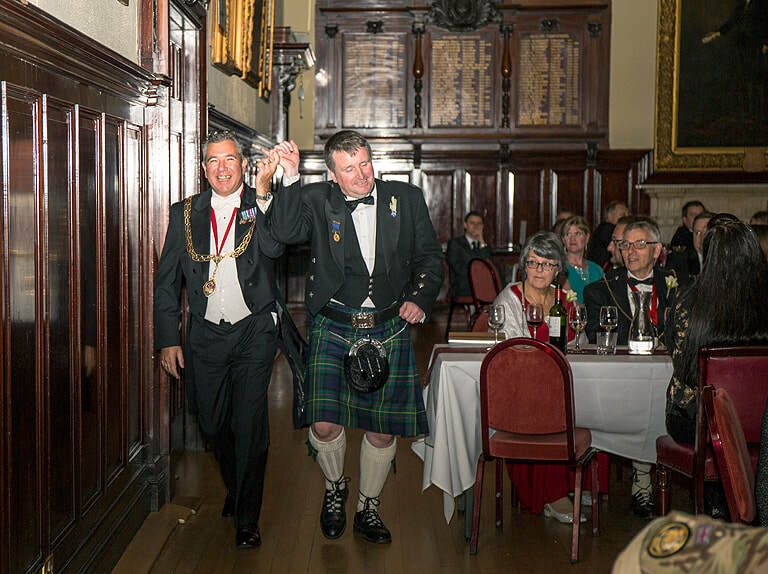 The reason for holding right pinkies was to ensure that a dagger could not be drawn and used against one another. The Deacon Convener receiving a cheque to the value of £1000 for Kinship Care from Deacon Gordon Weetch. Prior to the Deacon Convener replying to the toast to the Trades House, Deacon Gordon Weetch presented him with a cheque to the value of £1000 for Kinship Care, the Deacon Convener's Charity. The Deacon Convener thanked Deacon Weetch and the Incorporation for this generous gift and explained the importance of Kinship Care and the invaluable work being carried out by the House to care for looked after children. 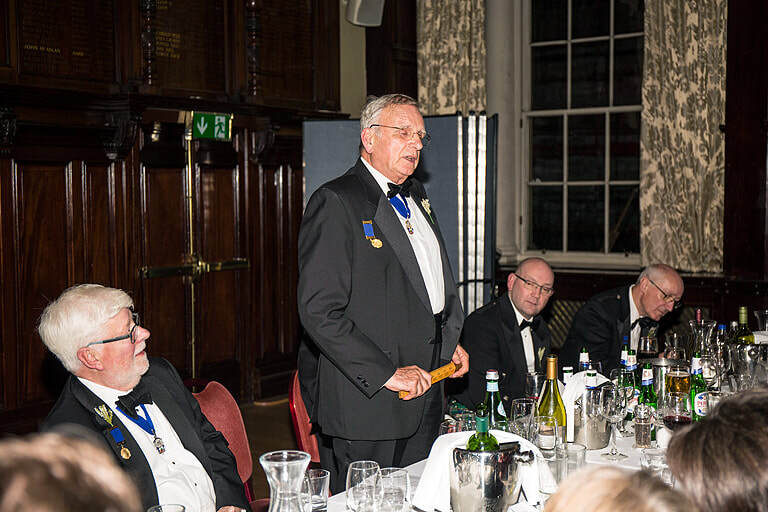 The Deacon Convener then gave a warm reply to the toast to the House where he highlighted the importance of Education and much that the House was involved with encouraging all ages to achieve their maximum. 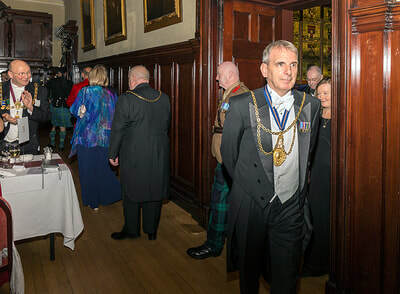 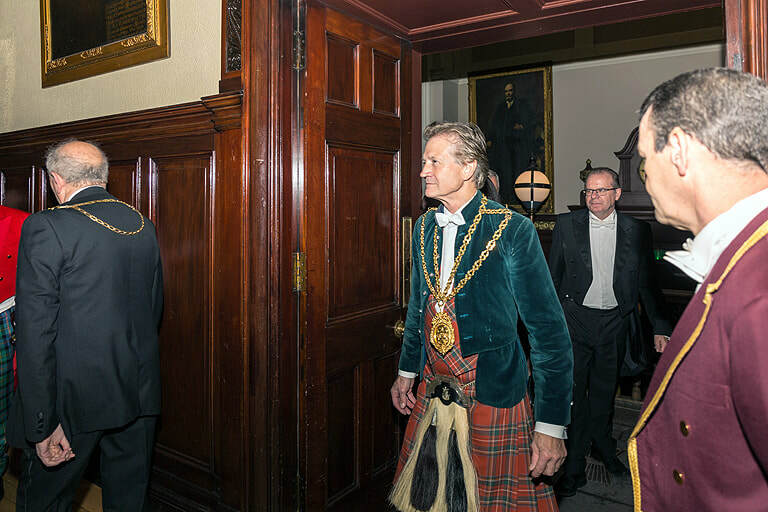 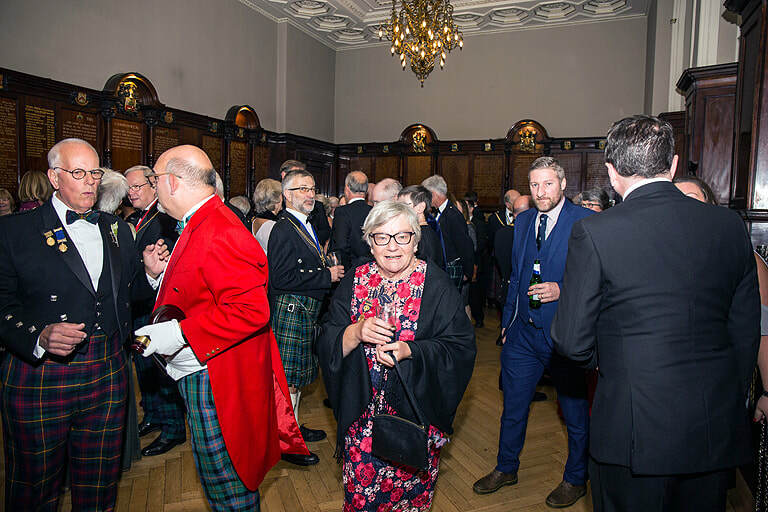 The Heritage of the House was also included and the point that we are one of Glasgow's major charities giving in the region of £75 000 annually to other charities, good organisations and individuals in and around Glasgow. Again there was another loud knock on the door and we had the pleasure of a visitation from the Incorporation of Wrights in Glasgow. 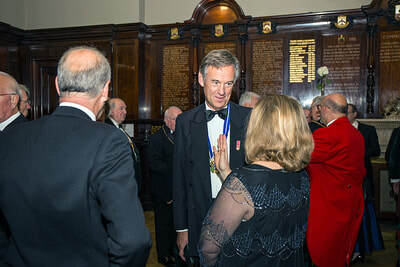 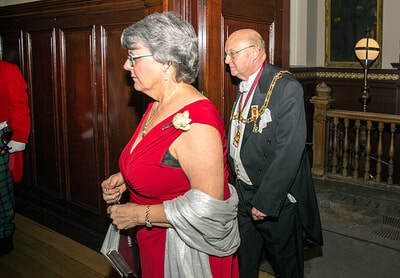 Due to our close connections with the Wrights, they always visit the Merry Masons at the Deacon's Choosing Dinner. Once again the tradition of the pinky was modified and the Deacon of the Wrights and Late Deacon David McLaren led in the Deacon of the Wrights. 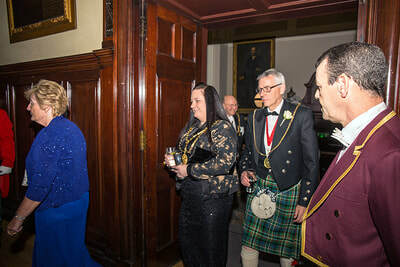 Again gifts and pleasantries were exchanged prior to the visitation leaving to the Strains of "Will ye no come back again" and they singing in response "Yes we will come back again". As normal, after any meeting which is chaired by the Deacon, the Late Deacon toasted the excellent manner in which he conducted the dinner and speeches. Late Deacon David McLaren carried out this honour and highlighted the great work that Deacon Gordon had carried out during his tenure as Collector and Late Collector. 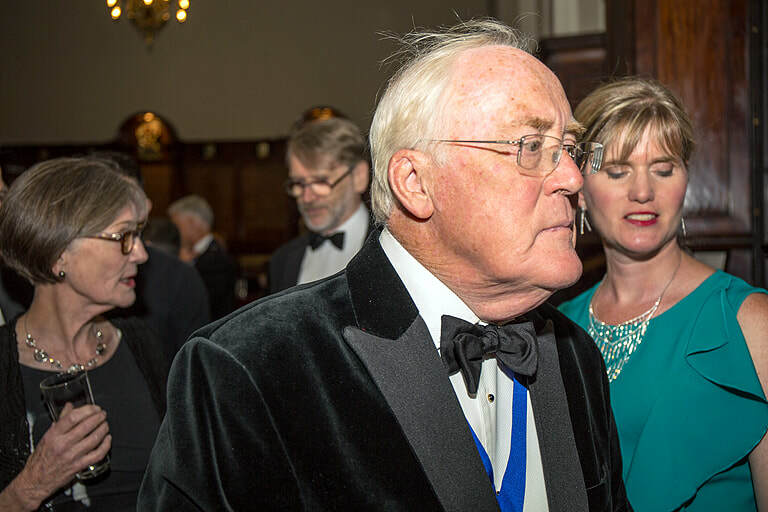 There is no doubt that the Masons will have another great year with another excellent Deacon. The Merry Masons always close their events with "Rapping of the Shed" by the most senior Deacon present and this year Jack Steel had the honour of being the oldest Deacon present in the room. After the Rapping, Auld Lang Syne was sung prior to people leaving and either going to the "Steps Bar" for a wee libation (The Worshipful Companies call this a Stirrup Cup, where we call it a wee swally) or heading home after a very enjoyable and successful evening.